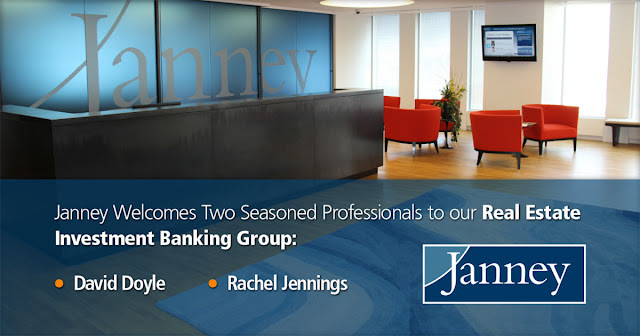 PHILADELPHIA, PA – October 17, 2016 – Janney Montgomery Scott LLC (“Janney”), a leading full-service wealth management, financial services and investment banking firm headquartered in Philadelphia, PA, announced today the recent addition of two seasoned professionals to its Real Estate Investment Banking Group. David Doyle joins as head of the group and Rachel Jennings will serve as a Managing Director. Mr. Doyle and Ms. Jennings bring more than 40 years of combined experience in investment banking and equity capital markets to the firm. They have successfully completed over 35 REIT and REOC initial public offerings as lead manager, representing an aggregate value of more than $10 billion for middle market companies. “David and Rachel’s proven track record of leading transactions in the REIT sector adds depth to our bench of experienced real estate dealmakers. With their extensive knowledge of the REIT space, we know they will continue to find success at Janney and expand our franchise,” said Cliff Booth, Head of Investment Banking. Prior to joining Janney, Mr. Doyle was the Head of Real Estate Investment Banking at Wunderlich Securities. Prior to Wunderlich Securities, Mr. Doyle was employed at Milestone Advisors. He co-founded Harbor Asset Management and previously served as Head of Real Estate Investment Banking at FBR Capital Markets. Mr. Doyle received his Master of Business Administration from Columbia University and a Bachelor of Arts from Hobart College. Ms. Jennings also joins the firm from Wunderlich Securities where she served as a Senior Vice President. Previously, she served as a Senior Vice President in Institutional Equity Sales at Compass Point Research & Trading and spent 11 years at FBR Capital Markets as a Senior Vice President in the Real Estate Investment Banking Group. Ms. Jennings has over 17 years of investment banking experience and has successfully completed more than $8 billion in public and private capital raising transactions for middle market companies in the Real Estate and Specialty Finance sector.